Garry Smith | The Goose Is Out! 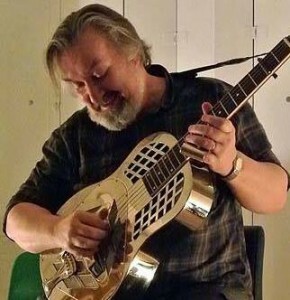 Garry Smith’s mission is to go boldly taking slide guitar out of the blues ghetto, leaving behind the usual Delta repertoire and concentrating on his own instrumentals and songs of longing, middle-aged lust and English Social History (or maybe an Irish ballad or some Tom Waits). He does all this on a National Tricone, the shiniest guitar you’ll ever see! Click here to go to Garry Smith’s website!